This is a fun half-day class that teaches basic fusible appliqué techniques. 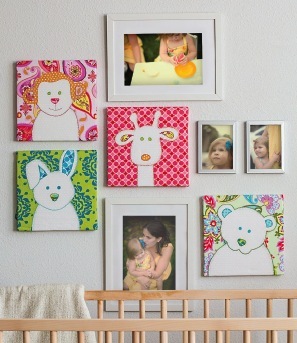 This whimsical project can be mounted on a canvas frame or finished as a wallhanging. It coordinates with the Welcome to the World quilt (both front and back) from Quilted Celebrations. Each student will need table space and access to an outlet for their sewing machine. One light table for every 3-4 students is recommended. 1. Have each student choose their favorite animal design. 2. Follow the instructions of pages 24-25 of Quilted Celebrations to complete the wallhangings. This can be done as part of the class or at home. 1. Follow the instructions on page 25 of Quilted Celebrations to mount the appliquéd block onto canvas. 1. Layer appliquéd block on top of batting and background and quilt as desired. 3. From binding fabric, cut 2 strips 2 ¼˝ x WOF. Join. Fold binding strips in half lengthwise and press. Sew binding to the outer edge of the wallhanging. Wrap around to back and hand stitch to secure. This is a fun full-day class that teaches basic piecing techniques. The modern design is suitable for all ages and tastes. This pillow coordinates with the Celtic Knot quilt (both front and back) in Quilted Celebrations. This project can also be made into a wallhanging. 6 hours. Students cut and begin piecing the pillow top in the morning. They complete the piecing and quilt the pillow top in the afternoon. They can assemble the pillow at home or assembly can be incorporated as part of the class. Each student will need table space and access to an outlet for their sewing machine. Pressing stations should be set up for piecing. Instructions for the Celtic Knot quilt block can be found on page 37 of Quilted Celebrations. 1. Cut a fabric A square from one of the fat eighths, one set of the fabric B rectangles from another of the fat eighths, one set of fabric C rectangles from another of the fat eighths, and one set of fabric D rectangles from the final fat eighth. 2. From the background fabric, cut 1 strip 1 ½˝ x WOF, 2 strips 2 ½˝ x WOF, and 2 strips 3 ¾˝ x WOF. 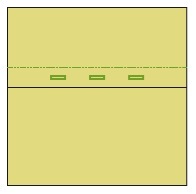 Subcut the 1 ½˝ strip into 1 rectangle 1 ½˝ x 18˝ and 1 rectangle 1 ½˝ x 10 ½˝. Subcut the 2 ½˝ strips into 4 rectangles 2 ½˝ x 12˝. Subcut the 4˝ strips into 2 rectangles 3 ¾˝ x 15 ½˝ and 2 rectangles 3 ¾˝ x 22˝. 3. Make a Celtic Knot block, as directed on page 38 in Quilted Celebrations. 4. Join a background rectangle 3 ¾˝ x 15 ½˝ to the sides of the block. 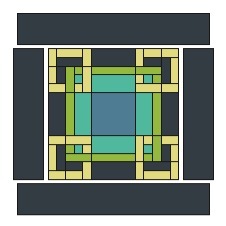 Join a background rectangle 3 ¾˝ x 22˝to the top and bottom of the block. 6. Trim quilted pillow top to a square 20 ½˝ x 20 ½˝. 1. Cut binding fabric into 3 strips 2 ¼˝ x WOF. 2. Cut pillow back fabric into 1 rectangle 12˝ x 22˝ and 1 rectangle 18˝ x 22˝. Turn under one long edge of each of the pillow back rectangles 1/2˝ and press. Turn under again 2˝ and press. Slip a strip of interfacing into the fold and fuse. Turn the pillow back pieces wrong side up and topstitch 1/8˝ from the first fold to secure. 3. Sew 1 buttonhole in the center of the folded edge of the larger pillow back rectangle. Add two more, each one 4 ½˝ from the center buttonhole. Open up buttonholes. 4. Baste top and bottom units together as shown on the Pillow Back Diagram, so that the edge of the top unit just overlaps the topstitching on the bottom unit. Mark button placement on bottom panel. 5. Place quilted pillow top on backing, wrong sides together, and baste 1/8˝ from pillow top edge. Trim excess pillow back fabric. 6. Fold binding strip in half lengthwise and press. Sew binding to the outer edge of the pillow front. Wrap around to pillow back and hand stitch to secure. Remove basting from back panel and sew on buttons.